Equipment / Preventative Maintenance | Major Medical Hospital Services, Inc.
Why choose MMHSI Inc. as your suction regulator service provider? Our primary objective is to aid your hospital in inspecting and maintaining your patient care suction equipment at an economical cost. We are committed to accurately determining your current inventory and verifying operational performances so as to meet manufacturer specifications. Code 5.1.13.8.4 of NFPA 99 requires the establishment of a program for both the medical-surgical vacuum piping system and the secondary equipment attached to the medical-surgical vacuum station outlets to ensure the continued good performance of the entire medical-surgical vacuum system. At MMHSI Inc., we believe in providing our customers with the best quality service at the lowest possible price. One way we can do this is through our “Repair Replacement” program. 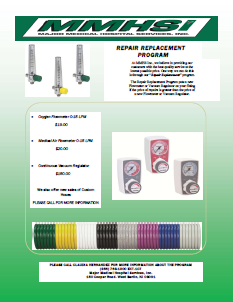 The Repair Replacement program puts a new Flowmeter or vacuum regulator on your fitting if the price of repairs is greater than the price of a new Regulator or Flowmeter.